"You should always go moose hunting with a partner." For over 50,000 years, the Great Hunt shaped human existence, creating a vital spiritual reality where people, animals, and the land shared intimate bonds. This compelling first-hand account by Larry Frolick takes the reader deep into one of the last refuges of hunting society: Canada's far north. The author travelled five years with First Nations Elders in remote communities across the Northwest Territories, Yukon, and Nunavut, experiencing the raw power of their ancient traditions. His vivid narrative combines accounts of daily life, unpublished archival records, current scientific research, First Nations myths, and personal observation to illuminate the northern wilderness, its people, and their complex relationships. 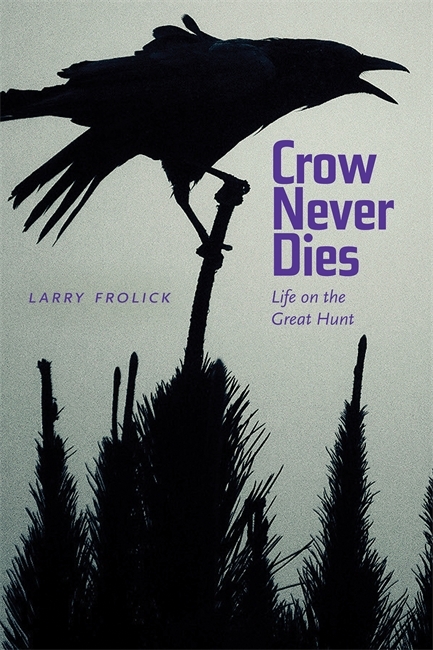 Readers of ecological travel narratives and Arctic adventures will enjoy Crow Never Dies. Larry Frolick has travelled and worked in the Arctic since 2005. He is an award-winning author of books on global culture. Previously with the Gwich’in Tribal Council in Inuvik, Larry Frolick is Communications Officer with the Government of the Northwest Territories. The author writes with obvious delight, indeed lyricism, about the people and the environment... To potential readers who have a love for the Arctic, its landscapes, seasons, and peoples, I highly recommend this beautifully composed and lyrical description of the traditions and way of life that struggle to keep their place in the modern world. [P]art travelogue, part philosophical inquiry, part participant-observation ethnography—and a wholehearted celebration of the North. Crow Never Dies is laid out in four sections, documenting cultural events and subsistence activities associated with each season.... Every chapter is built around personal conversations with Northern elders, hunters, and story-tellers.... [R]eaders looking for a refreshing and off-the-beaten-path look at Canada’s warming North, will not be disappointed by Crow Never Dies.